What is a push around vertical? 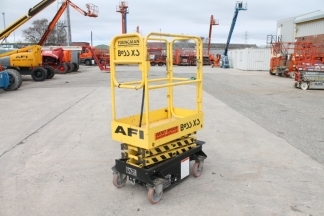 A push around vertical is a compact and easy to operate access platform that can be manually ‘pushed’ into place by the operator, before being lifted up to reach the area of height. What applications are push around verticals useful for? Due to their small size and light weight, push around verticals are perfect for working on floors that are unable to support heavy loads, such sports hall flooring. What training do I need to use a push around vertical? In order to operate a push around vertical (PAV), you will need to have IPAF push around vertical training. The course enables operators to manoeuvre, drive and position the machine. Please note, push around vertical training is not included in IPAF categories 1a, 1b, 3a and 3b. Our team are experts in servicing and maintaining push around verticals.